Grass fed, free range sheep, lamb, chicken, and eggs. All are antibiotic free. We are located in the foothills of the Smoky Mountains in Sevier Co., Tennessee. Our sheep and chickens enjoy fresh air, clean water, and 5 acres of pasture 365 days of the year. We raise Katahdin and Katahdin cross sheep. Katahdin sheep are a breed of hair sheep (they do not produce wool) developed in the United States. The Katahdin breed originated at the Piel Farm in north central Maine. Katahdin are hardy, adaptable, low maintenance sheep that produce superior lamb crops and lean, meaty carcasses. Since they do not produce a fleece they do not require shearing. They shed naturally each spring. They are medium-sized and efficient, bred for utility and for production in a variety of management systems. Ewes have exceptional mothering ability and lamb easily; lambs are born vigorous and alert. The breed is ideal for pasture lambing and grass/forage based management systems. Our chicken flock consists of white Leghorns, which lay white eggs, and Rhode Island Reds, which lay brown eggs. Leghorns are active chickens. 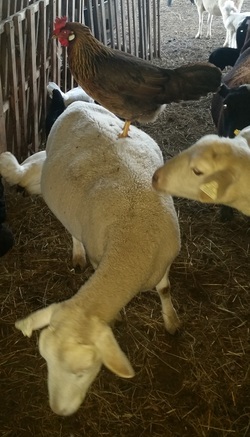 They are always willing to work, hunting and scratching, giving no prejudice to flower beds or dung hill; if there is scratching to be done, Leghorns are the chickens for the job. On range they are splendid foragers and small eaters. The breed is prolific, highly fertile, and hardy. Leghorn chickens lay very large numbers of white eggs – in fact, they lay as well or better than other breeds. The Rhode Island Red is not only America's best known breed, but is perhaps the world's best known fowl. It is the most successful dual purpose bird, and remains an excellent farm chicken.Rhode Island reds are very good layers of brown eggs, perhaps the best layers of all of the dual-purpose breeds.The hens of this breed weigh over 6 pounds. The Rhode Island Red is known for its hardiness and its ability to handle marginal conditions while still producing eggs. Additionally, eggs from hens raised on pasture may contain: 1/3 less cholesterol, 1/4 less saturated fat, 2/3 more vitamin A, 2 times more omega-3 fatty acids, 3 times more vitamin E, 7 times more beta carotene.